Please join us this Saturday, April 20th, at noon to support young authors at the annual Writers in the Schools BLOOMS reading event. BLOOMS is part of the Houston Young Writers Reading Series, and these young writers were chosen from thousands of children across the city of Houston. 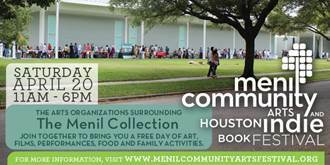 Children in grades K-12 will read original poems, stories, and essays on the lawn of the Menil Collection. Please clap loudly for these brave voices! We invite you to bring a blanket and a lawn chair and spend the entire afternoon with us enjoying poetry, music, film, and yoga at this festival for the whole family. For more information about the festival and a timeline of events, please visit the Menil Collection website. See you at 12 noon on Saturday!